Train to Busan Review | Nerd Much? Zombie films are a dime a dozen in this day and age of horror movies, with most failing to offer anything new or interesting to the formula. Most devolve into the same messages of “man is worse than monster,” with the zombies acting as more of an inconvenience than a tangible threat. Enter Train to Busan, a South Korean zombie film that aims to not only make the undead terrifying but add a new premise to them. Overall, the film is largely a success and one of the best zombie movies in the last decade, as it offers not only great set piece moments but thoughtful, fleshed out characters (no pun intended). The plot is simplistic at first as a deadly, fast-acting virus is sweeping throughout Korea (and presumably the world) turning people in ravenous, speedy undead monsters. 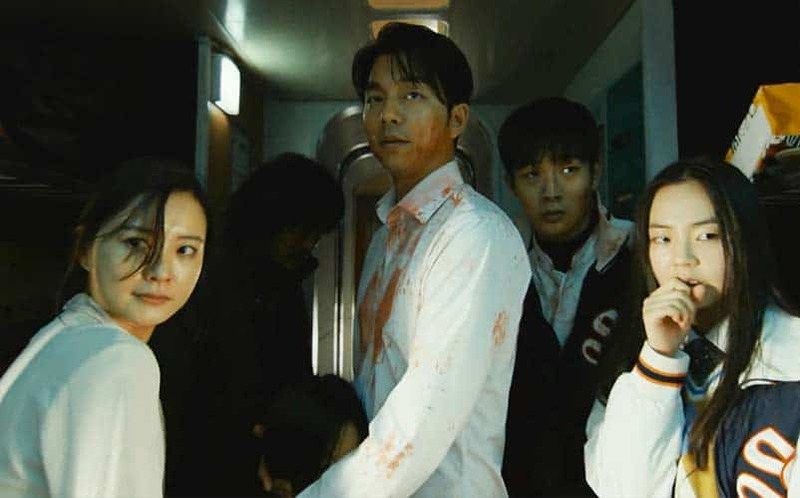 A large group of people are trapped on a high-speed train to Busan during the events, turning their passenger vessel into essentially an arc to stay relatively safe on. I say relatively because half of the train gets infested with zombies very early on, but will get to why they haven’t killed the others later. The shift to a train keeps the momentum for both the action and pacing of the film, as the various people need to decide when is the best place to disembark the train and go on foot. Director Sang-ho Yeon is surprisingly conservative with his script, not letting the passengers leave the train to explore the world around them. This helps Train to Busan as it doesn’t devolve into just another sightseeing tour of “interesting zombie-esque set pieces,” lending the movie a more claustrophobic feeling to the entire event. It’s rather impressive the amount of different shots, scenarios, and set-pieces Yeon gets out of a train, yet it all blends perfectly. This also helps a problem most zombie films suffer from, which is to make their ghouls actual, tangible threats. The zombies in Train to Busan are more along the lines of World War Z, in that they are sprinting, manic, and like to form massive piles of themselves for dramatic effect. 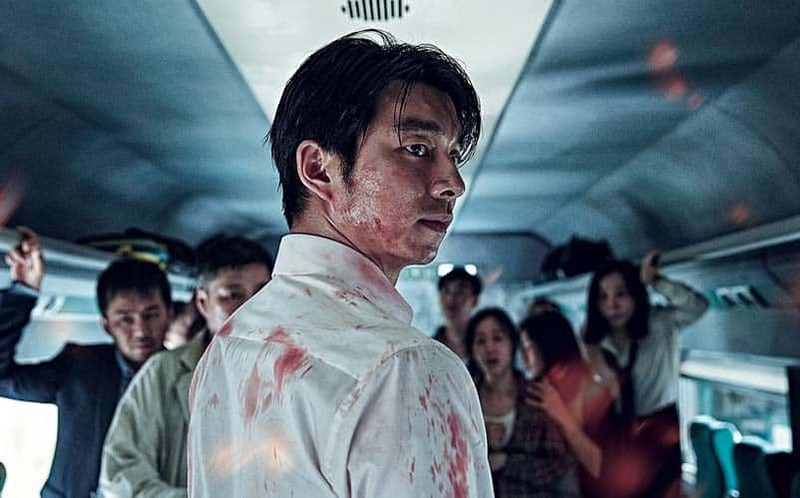 Train to Busan‘s twist is that the zombies have poor eyesight, which means if the train enters a tunnel they cannot see anyone around them and rely on sound to hunt. It’s an interesting concept and makes it so that zombies aren’t constantly beating on the doors to the survivors car. In terms of the ghouls themselves, their make is really well done and with the exception of a few wonky CGI effects their scenes are genuinely thrilling. However, the heart of this movie is father Seok-Woo (Yoo Gong) and his daughter Soo-an (Kim Soo-ahn) who are not only the moral story of this horror film but much of the narrative backbone. Seok-Woo has an estranged relationship with his daughter due to his obsession with not only work but himself. He is clearly a selfish person and only cares for the safety of him and his daughter for much of the first and second act. As you can image he does go through the typical arc someone with these traits goes through, but Yoo Gong’s fantastic performance sells every moment of it. Gong hits almost every emotional beat with perfection, which is only coupled by the excellent and adorable performance by Soo-ahn. Yet, these aren’t the only characters we are privy too as the supporting cast spans the gambit from expecting father/mother, a baseball team and one player’s crush, two elderly sisters, and a businessman. It’s the latter that’s one of the more interesting characters in this movie as he is clearly supposed to be the human antagonist for Seok-Woo. Yet, the character serves more of a purpose than just that, as he is the physical representation of what Woo could become if he continues to travel down this selfish path. The men think surprising alike early on and it’s not until the third act kicks in that you realize the businessman is supposed to be the villain. Yeon does a great job at balancing the various characters motives and personalities, without having them overburdened the script too much. Well, every character but the one homeless man. Part of me feels like the homeless man who gets on the train right before it takes off is supposed to have a bigger part in the story, but he really feels awkward here. His motivations outside of survival are never explored and the character almost feels too cartoony and over the top for this movie. Many of his scenes feel like nothing more than filler and during the third act, he’s supposed to have a big character moment that just doesn’t hit the emotional beats it needs too. Though in such a fantastic movie with great actors, his character quickly gets overshadowed and forgettable — which might be to the movie’s benefit. Train to Busan is a stellar movie and an even better zombie film. Sang-ho Yeon delivers a terrific, fast-paced thriller that will easily satisfy both horror and drama fans alike. He cleverly balances the soft human moments with giant hordes of flesh-eating ghouls chasing down potential victims, and by the end, you will find yourself invested in the many characters. Train to Busan isn’t just an example of what a great undead movie can be, but a loud, snarling declaration. Do not miss this movie.